Sorry, this learning module is not available for mobile devices. The enduring material is jointly provided by Beaumont Health, American Academy of CME, Inc., and the American Conference for the Treatment of HIV (ACTHIV). The 12th Annual American Conference for the Treatment of HIV (ACTHIV) was held April 5-7, 2018 in Chicago, IL. The Conference was supported by the Clinical Education Initiative, New York State Department of Health, AIDS Institute, and Midwest AIDS Education & Training Center Program. The conference and this web archive were supported by educational grants from Gilead Sciences; Janssen Therapeutics, Division of Janssen Products, LP; and Merck & Co. The web archive is also supported by an educational grant from ViiV Healthcare. To obtain online CE credit, please follow this link to the course post-test quiz and follow the instructions. Virginia Triant, MD, MPH Assistant Professor of Medicine at Harvard Medical School; Faculty Member in the Infectious Diseases and General Internal Medicine Divisions at Massachusetts General Hospital. Members of the HIV care team who are frontline providers of care to persons at risk of or with HIV infection, including physicians (both specialists and primary care/family medicine), nurse practitioners, physician assistants, nurses. Physician assistants, pharmacists, case managers and other healthcare professionals. This activity has been planned and implemented in accordance with the accreditation requirements and policies of the Accreditation Council for Continuing Medical Education through the joint providership of Beaumont Health, American Academy of CME, Inc., and the American Conference for the Treatment of HIV (ACTHIV). Beaumont Health is accredited by the ACCME to provide continuing medical education for physicians. Beaumont Health designates this enduring material for a maximum of 0.75 AMA PRA Category 1 Credit(s)™. Physicians should claim only the credit commensurate with the extent of their participation in the activity. American Academy of CME, Inc. is accredited as a provider of continuing nursing education by the American Nurses Credentialing Center's Commission on Accreditation. American Academy of CME, Inc. designates this educational activity for 0.75 contact hours (0.3 pharmacotherapeutic contact hours). AAPA accepts certificates of participation for educational activities certified for AMA PRA Category 1 Credit™ from organizations accredited by ACCME or a recognized state medical society. Physician assistants may receive a maximum of 0.75 hours of Category I credit for completing this program. All other participants will receive a certificate of participation. Your certificate for the activity will be made available immediately to print online. According to the disclosure policy of Academy and Beaumont, all faculty, planning committee members, editors, managers and other individuals who are in a position to control content are required to disclose any relevant relationships with any commercial interests related to this activity. The existence of these interests or relationships is not viewed as implying bias or decreasing the value of the presentation. All educational materials are reviewed for fair balance, scientific objectivity and levels of evidence. Disclosures will be made known to the participants prior to the activity. The opinions expressed in this educational activity are those of the faculty, and do not represent those of the Academy, Beaumont, ACTHIV or the American Nurses Credentialing Council's Commission on Accreditation. This educational activity is intended as a supplement to existing knowledge, published information, and practice guidelines. Learners should appraise the information presented critically, and draw conclusions only after careful consideration of all available scientific information. This activity contains off-label discussion. Virginia Triant, MD, MPH, has indicated she has no relevant financial relationships to disclose. The following planners have indicated they have no relevant financial relationships to disclose: Erika Aaron, MSN, CRNP; Julie Barroso, PhD, ANP, RN, FAAN; John T. Brooks, MD; Gina Brown, MD; Maggie Chartier, PhD, MPH; Sherrillyn Crooks, PA-C; Monica Gandhi, MD, MPH; John JD Juchniewicz, MCIS, CHCP; H. Nina Kim, MD, MSc; Natalie Kirkwood, RN, BSN, JD; Harry Lampiris, MD; Sharon Lee, MD; Bill G. Kapogiannis, MD; Edward Moylan, RP; Asa E. Radix, MD, MPH; Dianne Rausch, PhD; Cheryl Smith, MD; Brooke J. Taylor, MPH, CHCP; Ronald Dean Wilcox, MD; Barbara A. Young, MSW, LCSE, LCADC, SAC. Roger Bedimo, MD: Advisory Board: Merck & Co, Theratechnologies, ViiV Healthcare; Grant/Research Support: Bristol-Myers Squibb, Merck & Co.
Margaret Hoffman-Terry, MD, FACP, AAHIVS: Advisory Board: Gilead Sciences, Merck & Co., ViiV Healthcare; Chair, Board of Directors: American Academy of HIV Medicine; Promotional Speaker’s Bureaus: Gilead Sciences, Merck & Co., ViiV Healthcare. Hardware/Software Requirements To access this activity hardware and software requirements are noted below. Copyright 20187. American Academy of CME, Inc., Beaumont Health, and American Conference for the Treatment of HIV. Triant VA et al. 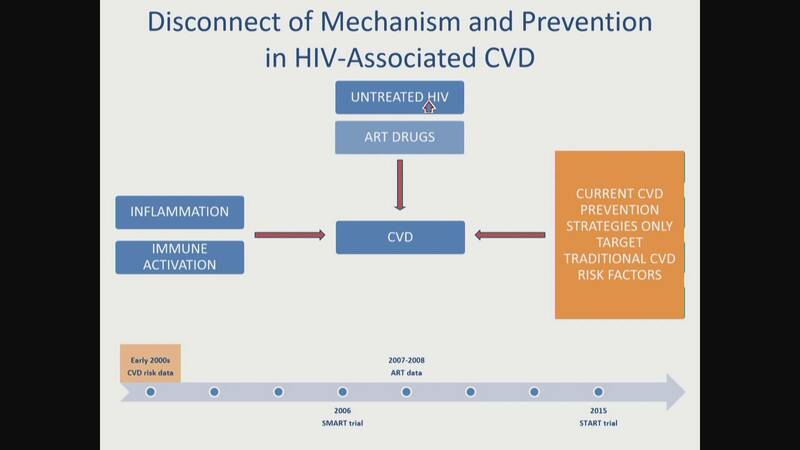 Cardiovascular risk prediction functions underestimate risk in HIV infection. Circulation 2018 Feb 14; [e-pub]. Phan BAP, et al. Utility of 2013 American College of Cardiology/American Heart Association Cholesterol Guidelines in HIV-Infected Adults With Carotid Atherosclerosis. Circ Cardiovasc Imaging. 2017 Jul;10(7). Lloyd-Jones DM, et al. 2016 ACC Expert Consensus Decision Pathway on the Role of Non-Statin Therapies for LDL-Cholesterol Lowering in the Management of Atherosclerotic Cardiovascular Disease Risk: A Report of the American College of Cardiology Task Force on Clinical Expert Consensus Documents. J Am Coll Cardiol. 2016;68(1):92-125. Feinstein MJ, et al. Assessing and Refining Myocardial Infarction Risk Estimation Among Patients With Human Immunodeficiency Virus: A Study by the Centers for AIDS Research Network of Integrated Clinical Systems. Jama Cardiol. 2017;2(2):155-162. Goff DC Jr, et al. 2013 ACC/AHA guideline on the assessment of cardiovascular risk: a report of the American College of Cardiology/American Heart Association Task Force on Practice Guidelines. Circulation. 2014;129(25 Suppl 2):S49-73. Stone NJ, et al. 2013 ACC/AHA guideline on the treatment of blood cholesterol to reduce atherosclerotic cardiovascular risk in adults: a report of the American College of Cardiology/American Heart Association Task Force on Practice Guidelines. Circulation. 2014;129(25 Suppl 2):S1-45. Virginia Triant, MD, MPH is Assistant Professor of Medicine at Harvard Medical School and a faculty member in the Infectious Diseases and General Internal Medicine Divisions at Massachusetts General Hospital. Dr. Triant earned her MD from the Yale School of Medicine. She is a practicing infectious diseases clinician in the inpatient and outpatient settings. Her research interests are in the area of clinical epidemiology/population health/outcomes and focus on the intersection between HIV and non-communicable disease complications, with a particular interest in cardiovascular disease. She developed and directs an HIV longitudinal clinical care cohort using data from a Partners HealthCare System-based data registry. Utilizing this cohort, she has led studies on HIV in relation to cardiovascular and metabolic outcomes, risk factors, prevention, risk prediction, and management. The overall goal of her research is to characterize the long-term medical complications of HIV disease to design and implement treatment and preventive strategies across diverse clinical settings.